Pride Fort Lauderdale hosted its first Pride Parade on the scenic highway that runs along Fort Lauderdale Beach where the majority of Pride events happened! This was my first time celebrating a Pride Festival on a beach, and oh boy, it did not disappoint. Fort Lauderdale is one of the most LGBTQ-friendly cities in America! With a large population of gay men (young & old) living there, you can truly feel at home in the city. 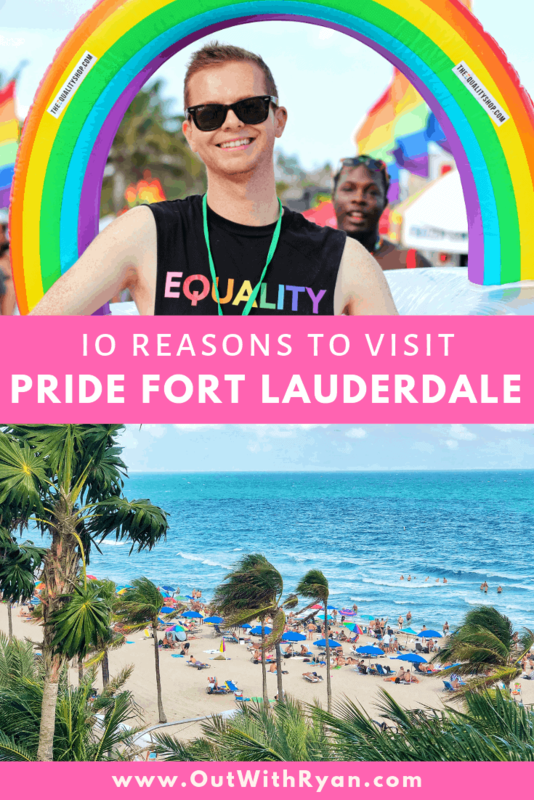 So here’s 10 Reasons why you should visit Fort Lauderdale during Pride! Share on FB or Save this post to read later! If you want to enjoy shirtless men (Daddies, Twinks, and Bears, oh my!) in speedos & dance with friends in the sand, you can! If you want to have a few drinks in the sun and relax on the beach where the Pride Festival is, you can! There’s so many ways to celebrate Pride in Fort Lauderdale. There’s also something truly unique about physically being on a beach and celebrating Pride festivities as oppose to celebrating in the streets. Celebrating pride on a beach was truly a vacation in paradise. Pride Fort Lauderdale’s theme was Carnival and the parade was truly a Carnival. The carnival theme brought colourful floats (and an abundant of hot men) as well as brought together diverse ethnic communities that call Greater Fort Lauderdale home. It was the first pride parade to be on the scenic A1A Highway where parade-goers could watch the parade from the Fort Lauderdale beach! There were an estimated 80,000 people watching the parade between the gay beach (Sebastian Beach) and the Fort Lauderdale Beach Park. Sebastian Beach has been known as the “gay beach” in Fort Lauderdale, aka the beach spot in front of Sebastian St. where the gays come to sunbathe & relax. During Pride, there was a gay beach party, specifically a Bear Beach Party, but all body types are welcomed! I didn’t take up-close photos of others since we noticed some bare bums & trying to not to make this website Rated R 😉 but from a far, you can see the many gays with their rainbow umbrellas! Make sure to check out Sebastian Beach if you want to beach with local gays and check out Pride Fort Lauderdale website for official beach parties! Every Pride, Fort Lauderdale brings out iconic LGBTQ+ headliners for their Pride Festival! This year, they had Todrick Hall & Ada Vox! I actually got to hang out backstage with Todrick before his show & also hang with a friend of mine who was Todrick’s back-up dancers for the night! photo credit to SRL Media, Inc.
With this year being the 50th Anniversary of Stonewall, it was a privilege to attend the annual Stonewall Museum & Archives Gala during Pride Fort Lauderdale! Anyone can buy tickets to attend every year and the gala hosts special guests, dinner, cocktails, a silent auction, and entertainment all to raise money! The special guests this year were Kathy Najimy from Hocus Pocus, Sister Act and Rat Race (hilarious woman! ), as well as TV personality and Trans’ rights activist, Jazz Jennings! Highly recommend getting tickets to this Gala if you can! It was a great evening of networking, celebrating and raising money for a good cause. Pride Fort Lauderdale teamed with the South Beach Wine & Food Festival for a fabulous drag brunch at the Ritz-Carlton Fort Lauderdale Beach. This brunch had a wide selection of food & alcohol, including avocado toast & bubbly (my fave brunch), and had the funniest drag queens perform. From delectable dishes created by local celebrity chefs to performance’s by top local drag queens, you can’t miss the popular Drag Queen Brunch during Pride Fort Lauderdale. Wilton Manors is basically the “gay village” or “gayborhood” of Fort Lauderdale. It’s known as the heart of gay nightlife and entertainment. And during Pride Fort Lauderdale, the Wilton Manors gay bars are PACKED (as you can imagine with most prides in major cities)! Pride weekend is the best time to be out at the gay bars because there’s a large selection of men to choose from. It’s a great night to meet locals & internationals visiting! Enjoy drink specials, discounts & live entertainment at participating businesses, all night, up and down Wilton Drive. From Drynk Lounge to Hunters and Georgie’s Alibi Monkey Bar for drinks to finishing the night clubbing at The Manor Complex, I had an amazing time at the gay bars and clubs in Fort Lauderdale! I even got to meet new friends and chatted with complete strangers at the bar over drinks (my fave to do since I love meeting new people!). 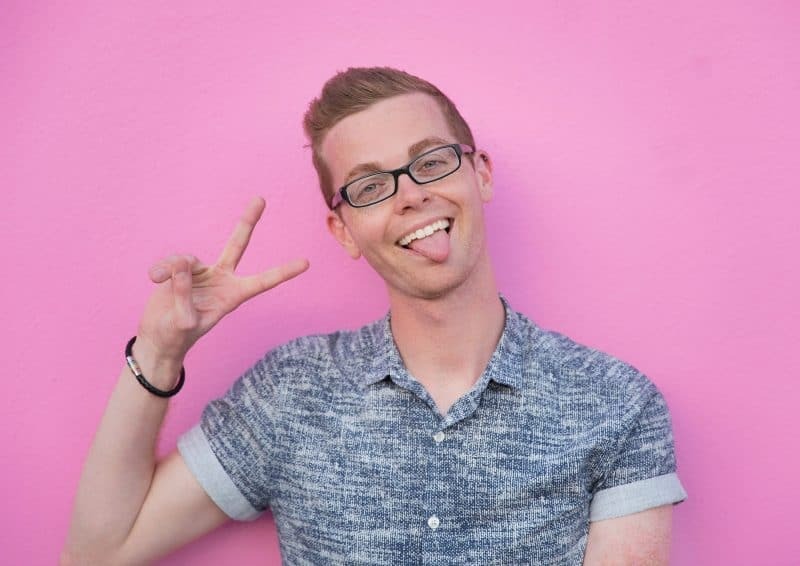 For the first year, Pride Fort Lauderdale kicked off Pride weekend with a fierce Runway Fashion Show at the Hard Rock Hotel & Casino with Niomi Smalls & Carson Kressley from Rupaul’s Drag Race as the hosts! They had male, female, transgender and drag models sashay across the runway in avant garde outfits, which was fabulous! Naomi and Carson were so hilarious as hosts and there was lots of iconic pieces from the runway looks. What I loved most about the hotel I stayed at was that they have the world-famous Wreck Bar that has Burlesque Mermaid & Aquaman Shows! The B Ocean Resort is located right on the Fort Lauderdale Beach which is right beside the Pride Festival. About the mermaid show: Inside the B Ocean Resort is a 21+ bar called the Wreck Bar where they have weekly mermaid shows with special aquaman nights. Enjoy a tropical cocktail or dine on fresh seafood while you watch through portholes at swimming mermaids! Hopefully next time I visit I’ll ask the hotel manager if I can live my little mermaid Ariel fantasy!Click here for more details on the shows! One of the most amazing things about Pride is being able to connect with local shops and vendors; especially LGBTQ vendors. The festival brought in exhibitors and food vendors from all around Greater Fort Lauderdale! My favourite thing about walking around the vendors and collecting swag (yay free condoms!) was actually checking out the LGBTQ Vendors selling unique LGBTQ and Pride-related clothing! This is the perfect time to pick up any pride gear you don’t have in your closet hunn!